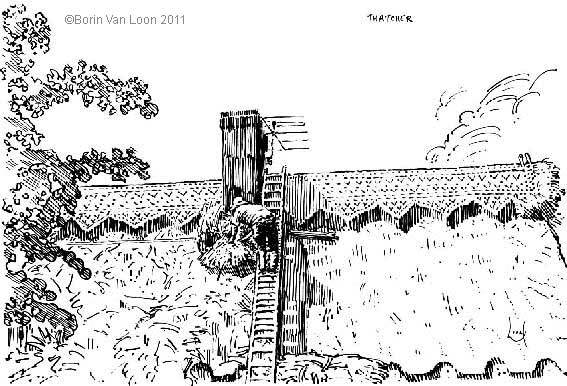 Don Mathew's book 'Cycling Through Suffolk: A Tour in 1996'; the design and illustration by Borin Van Loon, with many reference points in cycling, environment, local history, Suffolk pubs, vineyards and food. Not to mention weather, road conditions and the people met on the way. Don is a Suffolk man, born and bred: historian, cyclist, bon viveur and transport campaigner. The book is available from Amazon.co.uk at £4.75. Thatcher at work in Glemsford, Suffolk; for environmental reasons the thatcher is using the shorter-lived straw as thatching material rather than the traditional and more durable Norfolk reed. The large number of thatched houses and barns comprise one of Suffolk's greatest treasures. 'This is a record of a cycle journey I made round Suffolk in 1996. Its impetus was a feeling that, having lived mostly in London for eleven years, and also made changes in my working life, I had somehow become "cut off" from my roots. Also, living in the far north-east corner of the County, much of it felt a mystery to me. At the same time, having worked hard for a number of years I felt I needed a complete break of some kind. This in no way pretends to be a "Guide to Suffolk". Indeed, I did not deliberately did not visit places with which I was familiar, so no mention is made of some of the best known and attractive places, such as Bungay, Dunwich, Orford, Southwold,Walberswick and Westleton. 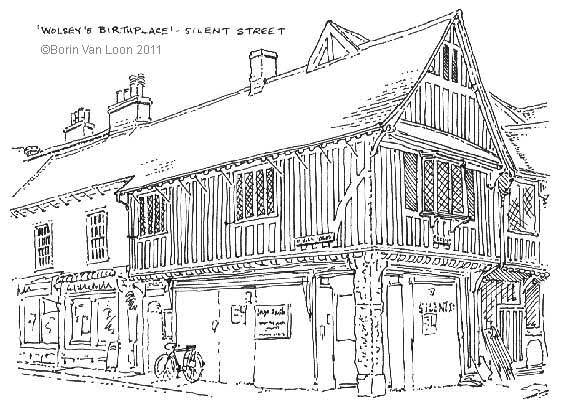 On the corner of Silent Street, Ipswich (which some believe takes its name from the massive population depletion during the Black Death, but is more likely related to the straw laid on the road to muffle horse hhoves and carts passing nearby Curson House when it was used as a seaman's hospital), lies an impressive timber-framed building, which stands close to the birthplace of the right-hand man of Henry VIII, Cardinal Wolsey - whose patronage could (until his fall from grace) have turned the ancient town into a second Oxford. Don's bicycle leans against the boarded-up shop front. This building was a disused chemist's shop when Borin first moved to Ipswich in 1979; still disused at the time after twent-two years, it's a crying shame that it took so long forsomeone to make full use of this nationally important property. Thanks, at last, to Ipswich Building Preservation Trust. Er... it's an estate agent's shop.
' "I do some political lobbying for Sustrans, the bicycle lobbying movement," he said.